Lithium ion battery market is gaining momentum in the Europe owing to government initiatives to promote electric vehicles and related infrastructure and growing efficient power demand, along with declining cost of energy storage systems and shift towards cleaner fuels. By capacity, 5-25Wh and 48-95Wh together dominated the market and registered major share in consumer electronics application, followed by 15-99KWh sub-segment in the electric automotive industry. According to 6Wresearch, Europe Lithium Ion Battery market size is projected to grow at a CAGR of 15.9% during 2018-24. Lithium ion battery has emerged as most favored power source for wide range of consumer goods including mobile phones, toys, e-bikes and passenger vehicles due to its high efficiency and rechargeable feature. Currently, consumer electronics application accounted for major Europe lithium ion battery market share, followed by industrial and automotive applications. However, during the forecast period, automotive application is expected to depict highest growth due to strict regulation enforced by government and initiatives resulting in increasing demand for electric vehicles. Germany is a major consumer of lithium ion batteries in the overall European market, followed by UK and France, owing to high penetration of smartphones, increasing installation of lithium ion based energy storage and rising demand for electric vehicles. However, Nordic countries are gaining share in lithium ion battery market owing to high usage of electric vehicles, particularly in Norway. The Europe Lithium Ion Battery Market report thoroughly covers Europe lithium ion battery market by power capacity, material, components, applications and countries. 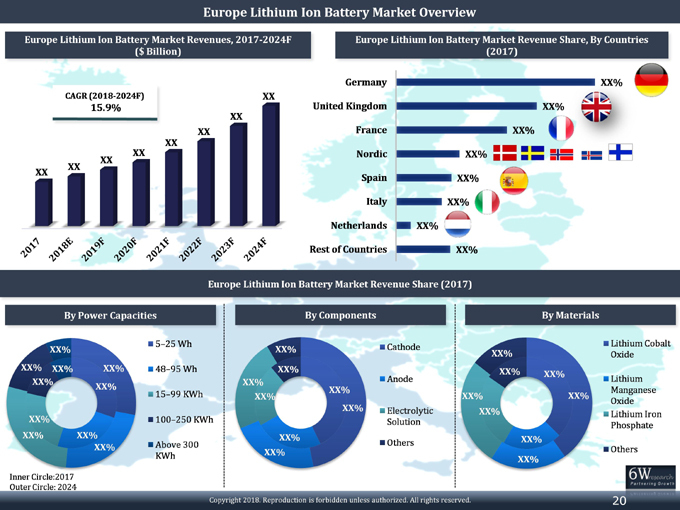 The Europe Lithium Ion Battery Market outlook report provides an unbiased and detailed analysis of the Europe Lithium Ion Battery Market trends, opportunities/high growth areas and market drivers which would help the stakeholders to device and align their market strategies according to the current and future market dynamics. • Historical & Forecast data of the Europe Lithium Ion Battery Market Revenues for the period 2014-2024F. • Historical & Forecast data of the Germany Lithium Ion Battery Market Revenues for the period 2014-2024F. Applications and Regions for the period 2014-2024F. and Regions for the period 2014-2024F. Capacities, Applications and Regions for the period 2014-2024F. • Europe Lithium Ion Battery Market Trends and Developments. 14.3 Contemporary Amperex Technology Ltd.
14.10 Samsung SDI Co. Ltd.